The Minnesota Vikings were 0-1 after losing in a sloppy performance at New Orleans as they hosted the Denver Broncos on September 11, 1978. Head Coach Bud Grant’s team had dominated the NFC Central with 9 division titles over the previous 10 years, but had not won a Super Bowl and star QB Fran Tarkenton was giving indications that this would be his last season. The Broncos were AFC Champions in 1977, although they lost badly to Dallas in the Super Bowl. Coached by Red Miller, they were carried by their tough “Orange Crush” defense while veteran QB Craig Morton guided the conservative offense. Denver started off in Week 1 with a win over the division-rival Raiders. There were 45,508 fans in attendance for the nationally-televised Monday night game at Metropolitan Stadium. What they saw was dominance by both defenses. An early series by the Broncos ended with the Vikings recovering a lateral that went awry at the Denver 23. The Vikings converted a fourth down at the 13 but three plays later WR Sammy White dropped a pass in the end zone and Minnesota settled for a 24-yard field goal by Rick Danmeier, a nondescript placekicker who had spent the ’77 season on injured reserve. He was filling the shoes of Fred Cox, who retired following 15 productive years in Minnesota. The defenses dominated the rest of the half. The closest scoring opportunity came when Denver drove into Minnesota territory and, as the game headed into the second quarter, reached the 10 yard line. However, a third-down pass was picked off in the end zone to end the threat. The turnover-prone Broncos could not move the ball effectively and the Vikings were plagued by dropped passes. The score remained 3-0 at halftime. Minnesota took the second half kickoff and drove to another Danmeier field goal, this time from 46 yards. CB Nate Wright intercepted a Morton pass on the next series and the Vikings drove inside the Denver five but the Broncos stiffened and Danmeier booted a 21-yard field goal. Down 9-0, backup QB Norris Weese (pictured below) relieved Morton for the Broncos. Early in the fourth quarter, DE Lyle Alzado blocked a Minnesota punt to give Denver the ball at midfield. The big special teams play brought the Broncos to life on offense and they drove to a one-yard touchdown carry by FB Jon Keyworth, although DT Alan Page blocked the extra point attempt to keep it a three-point game. A short series by the Vikings resulted in a punt, but a good return by WR Rick Upchurch was nullified by a penalty and Weese threw a long interception. Minnesota ran time off the clock and punted, with the Broncos regaining possession with a little less than two minutes remaining in regulation. Weese directed Denver on a 37-yard drive to the Minnesota five, but the clock was down to 11 seconds left and the Broncos were out of timeouts. Weese rolled out to his right, was unable to find a receiver, and was tackled for the loss of a yard. The officials stopped the clock with three seconds remaining, ruling that it was a sack and not a running play. An infuriated Coach Bud Grant, showing uncharacteristic emotion, ran onto the field to argue the stopping of the clock with the referee and was restrained by Page. Both he and Tarkenton insisted that Weese had left the pocket and was thus a runner. The Broncos were able to get the kicking team onto the field before the last seconds ticked off and Jim Turner booted a 25-yard field goal to tie the score at 9-9 and send the game into overtime. With Tarkenton nursing a hand injury, Grant put second-year backup QB Tommy Kramer into the game for the overtime period. The Vikings won the toss to gain first possession, and that was all they would need. The winning drive in overtime went 56 yards in 10 plays. Key events along the way were Kramer running for a first down, completing a pass to HB Robert Miller that gained 14 yards, and a 15-yard personal foul penalty called on Denver nose tackle Don Latimer. At just under three minutes into the extra period, Danmeier kicked a 44-yard field goal – his fourth with no misses – to win the game for the Vikings by a score of 12-9. In a contest that featured two tough defenses, the Broncos had the edge in total yards (231 to 206) and first downs (18 to 13). However, they also turned the ball over six times, to three by the Vikings, and Denver quarterbacks were sacked six times. Fran Tarkenton completed 13 of 27 passes for just 98 yards with no TDs and three interceptions. In the overtime period, Tommy Kramer went two-of-seven for 22 yards. RB Chuck Foreman rushed for 59 yards on 22 carries and caught four passes for 28 more yards. Robert Miller had the most receiving yards for the Vikings with 31 on his three receptions. 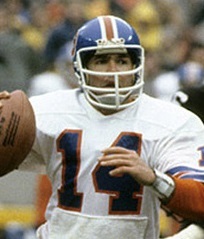 Rick Danmeier was the scoring star with his first four NFL field goals. For the Broncos, Craig Morton was successful on 9 of 21 throws for 90 yards with two intercepted before giving way to Norris Weese, who completed 6 of 11 for 81 yards and had one picked off. HB Otis Armstrong had 64 rushing yards on 14 attempts. Jon Keyworth gained just 13 yards on 6 carries, but one was for a TD and he led the team with four pass receptions, for 27 yards. WR Haven Moses had 53 yards on three catches. The Vikings went on to once again win the NFC Central, but with a mediocre 8-7-1 record. They lost handily to the Rams in the Divisional playoff round. Denver recovered to win its next three games and topped the AFC West at 10-6. The Broncos also lost in the Divisional round, to Pittsburgh. Rick Danmeier had a respectable season as he was successful on 12 of his 19 field goal attempts and 36 of 37 extra point conversions. 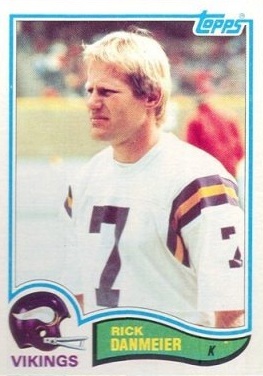 One of the last straight-ahead placekickers, he played for six years with the Vikings, through 1982. Overall, he kicked 70 field goals and scored 364 points.